We all know that the broadcasting is destined to all network devices. It is a method for broadcasting to transfer a message to all recipients simultaneously. It can be performed as a high-level operation in a program. In this method, the packet is sent to all nodes even if they do not want it. Router create configured to forward broadcast in some special cases. This broadcast message is destined for all network devices. So the router creates a data packet and then send it to each host one by one. The router creates multiple copies of a single data packets with different destination addresses. All packet are sent as unicast but because they sent all, It simulates is broadcasting. Secondly, when a router receives a packet that is to be broadcast, it simply floods those packet out of interfaces. All routers are configured in the same way. This method is easy on the router on CPU but may cause the problem of duplicate packets received from peer routers. 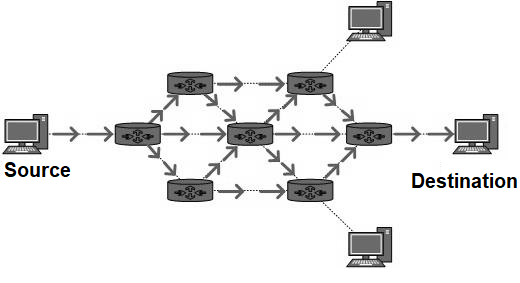 Reverse path forwarding is a technique in which router knows in advance about it predecessor from where it would receive the broadcast. This technique is used to detect and also some discard duplicates.